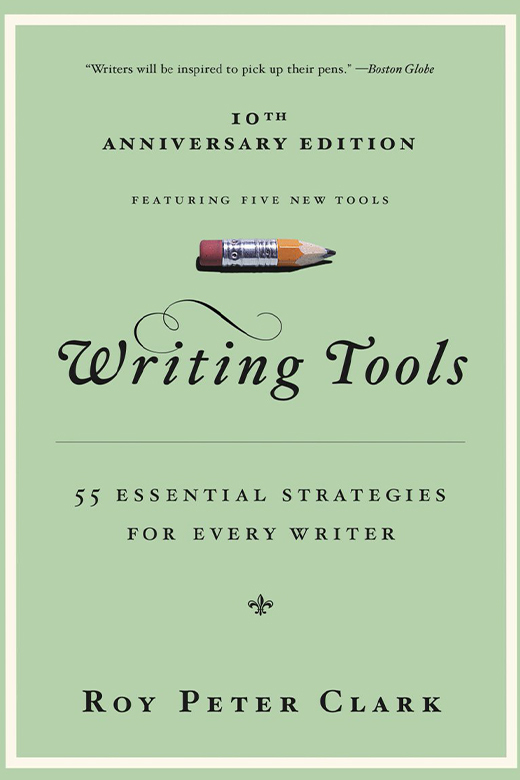 Roy Peter Clark's Writing Tools provides the essentials to improve your writing. It is duct tape, pliers, and a 2lb sledge hammer for anyone who desires to put pen to paper or fingers to the keyboard. If you prefer, this handbook is a writer's a map, compass and an encouraging guide. 1. Nuts and bolts: Help for making sense when it comes to words, sentences, and paragraphs. 2. Special effects: Tools of economy, clarity, originality, and persuasion. 3. Blueprints: Ways to organize and build stories and reports. 4. Useful habits:: Routines to build a writing life. 1. Tool 41, "Turn procrastination into rehearsal" discusses the importance of Setting the table (learn what you need to do to de-clutter your writing workspace), Keep a daybook (find the system that helps you store ideas, phrases, a key insight, etc), and draft sooner (writer earlier in the process so you discover what information you need). 2. Tool 14, "Get the name of the dog." Clark urges me to dig for the concrete and specific, details that appeal to the senses. 3. Tool 9, "Let punctuation control pace and space." This was the most help I have ever received on punctuation. 4. Tool 40, "Draft a mission statement for your work." 5. The writer's blueprint: Writing is not magic. There are 5 words that shape the way writers work: Idea (the writer conceives one); Collect(collect things to support the idea); Focus (discovers what the work is really about); Draft attempt a first draft; Clarify (revise in the quest for greater clarity). Clark provides a "Workshop" at the conclusion of each Tool/Strategy. Yes, he is going to ask you to work it out. I love it. If one reads this and doesn't improve, that writer can lay the blame at his own front door.